Encouraging new homeschool moms, and moms starting a new curriculum ~ You may need to adjust or adapt your homeschool approach, content, schedule and expectations. Sometimes, a little tweak will provide the necessary space and grace to accomplish the work without undue stress and frustration. When you or your child experience some of these negative emotions on a daily basis, you may need to make some more serious adjustments. Narrations = decide how much you will read before asking for a narration. Start with a paragraph before moving on to a full chapter. Adjust the length of copywork = give shorter selections, especially for a young child who is still learning to master his handwriting. Adjust dictation passages = adjust the size of the passage to fit your child’s reading fluency or adjust the size of the phrases you dictate for her to write. Adjust the length as the child’s confidence strengthens. Any other lesson or activity = select the amount work that the child does to suit their ability; tick off the maths problems or draw a line under the work needed for that day. Assist your young or struggling child by writing out the key words or important ideas from the passage. As your child matures and manages to remember the content and details of the chapter, he will make these notes himself and eventually rely on mental memory rather than notes to recall his narrations. An effective spotlight will allow the student to think for himself and make his own personal relations, and not be ‘spoon-fed’. Create a word bank with key words on a board, or create a short list to spotlight the key ideas of the passage. This list provides reminders for the child’s narration. Use textmapping to help your child remember their ideas. Here the child highlights the most important ideas, in different colours, to help note key concepts. Number the correct sequence to help keep events in the correct order = or use these sequential clues = “First, this happened. Then … After that, such-and-such happened … Finally…” This helps a child remember the story sequence. Gently encourage your child to write an opening sentence and then the concluding sentence. Work on developing 3 sentences that form a paragraph. Before long he will be doing more and more of his own written narrations. Spotlight specific topics in subject = a specific focus in nature study. Spotlight specific techniques used in handicrafts or art instruction. Substitute a different book for your student. It should be a well-written living book, one that contains worthy thoughts well put and inspiring tales well told. Find a story that “clicks” with your child. Grade up or down as needed. Personalize mental math by substituting names of people or objects in your child’s life according to their personal interests. Substitute the pictures you use for picture study. Feel free to substitute a different work by the same artist. You want your child to connect with the artist and his works. I often provide 6 examples and allow my child to choose the 4 we will study each week for that month. Find an alternative activity that your child enjoys instead of the prescribed narration – there are so many options and alternatives! 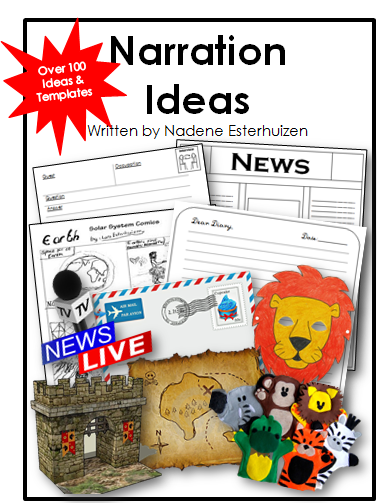 Purchase my Narration Ideas booklet with over 100 ideas and options instead of just writing! My golden rule = Add more time! Adjust the speed at which you move through the lessons especially with skill-based subjects such as math or language arts skills like reading, writing, and grammar. Don’t move on to the next concept until your child has a comfortable grasp of the current one. So much of math and language arts builds step by step: the next concept that will be introduced depends on mastery of the current concept. So don’t get in a hurry. Add other exercises from alternative books or games to practice more on certain skills or activities. Hopefully the examples shared above will give you some ideas of how you can adjust the size, spotlight key concepts, make personalized substitutions, or adjust the speed of the content as you use Charlotte’s wonderful methods with your student.